Change is inevitable. The ability to get ahead of shifting trends and market dynamics is the lifeblood of any successful organisation. The financial services industry – usually considered risk averse, slow to change and somewhat staid – is ready for a shake-up. Today, we require more from our service providers: more innovation, a wider choice, a greater understanding of our needs. To stay competitive and ahead of the game, financial services providers need to be willing to be brave and step outside their comfort zone. It takes a certain type of person to challenge the status quo, particularly in this industry. 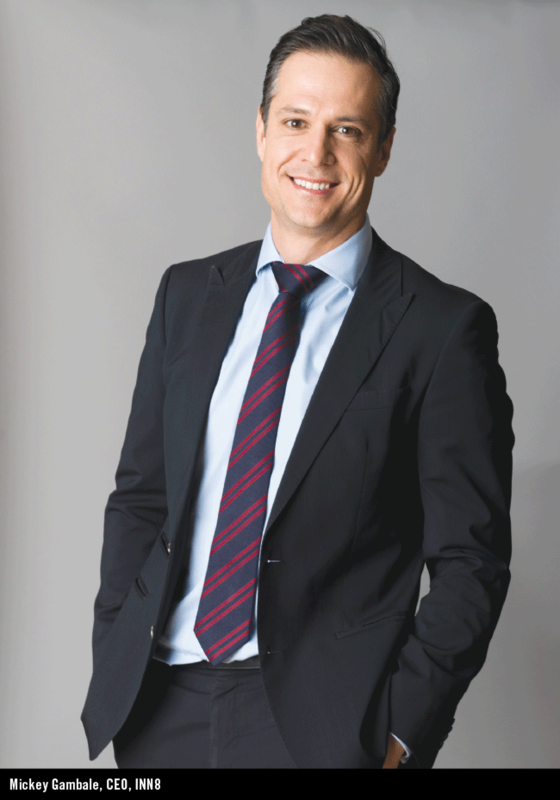 One such leader blazing the trail is Mickey Gambale, CEO of INN8, SA’s first purpose-built, adviser-inspired wealth management proposition. Gambale has two decades of industry experience under his belt and knows how ‘things have always been done’. He believes it’s time for something new. More than just another investment platform, INN8’s proposition goes further than current investment platform offerings, which are often built on legacy or banking systems and were not designed with the advisers’ needs in mind. It’s a grand idea that sounds good on paper, but how do you translate this into a successful business proposition? ‘We needed to distil our vision into a rock-solid strategy, and then build the culture that would enable us to deliver,’ says Gambale. ‘To bring such a daring vision to life, you need to create the right culture first. A mismatch between your grand vision and the environment in which it must grow is a fatal blow to any new venture. ‘Our culture is dynamic, agile, it’s ready and willing to adapt, and always two steps ahead. Curious, boundary-pushing and always learning – that’s the core of who we are at INN8. Gambale embarked on a global search for people to help create this unique, fresh culture and inject new thinking and external best practice into the organisation. The result, he adds, is a very clear focus on how things are done in the business: lean, agile and always improving. In a world of constant noise and options, how do you set yourself apart? How do you get a financial adviser to choose your offering and, most importantly, to stay with you? A buzzword often bandied about is ‘client centricity’ – but Gambale believes that this is an overused, nebulous concept that doesn’t take it far enough. So he approaches it from a different angle: ‘How do we want our clients to feel after they interact with us? The answer: We want to delight our advisers and their clients every time. We want them to come away thinking “That was a great experience”,’ he says. ‘We all know from our own daily interactions with brands and service providers that it’s not always product features or even pricing that builds brand loyalty. Leading brands have realised that it’s the customer experience that makes the difference. ‘In our industry, compliance considerations, legacy processes and the cost of change have often got in the way of providing that awesome experience to customers. Our job at INN8 is to find ways to balance the fundamentals of industry requirements with the satisfying journey we want to provide to our clients. Thus, customer experience is at the heart of everything INN8. ‘CX is a much more clearly defined concept than client centricity. It allows our business to focus and mobilise teams better.’ Gambale understands that making the decision to become a customer experience-focused business can be a seismic change for an organisation, and for many it can feel like a step too far, as it involves a fundamental shift in the organisation’s approach, strategy and tactics, from top to bottom. It’s a big step, but it’s one Gambale and his team are excited to take. ‘This is not something you can do alone. Every one in the business has a role to play, and collaboration is key,’ he says. Investment platforms are evolving to enable advisers to use a single platform to access information, manage compliance and gain insights to inform their investment choices, going further than simply reviewing and managing investments. Gambale acknowledges that ‘nobody can be the best at everything – and you don’t have to be. What you do need, however, is access to those who are the best in the game. So, we focus on what we do best and partner with the experts in the industry, whether technology or investment specialists’. Successful collaboration depends on the culture that has been ingrained in the organisation. Gambale and his team have worked hard to ensure that everyone is given a voice: staff, advisers and their clients. Even those internal departments that don’t deal directly with customers play a role in the customer experience: their contributions play an important part in creating that superlative customer experience that INN8 aspires to. Shared learning across teams, and even with external partners, is crucial. ‘Collaboration prevents stagnation and allows us to learn from the best,’ says Gambale. ‘At INN8, we ultimately exist to help the adviser grow their business and, in turn, provide holistic advice to their clients, achieve clients’ investment goals and meet their outcomes. We aim to help advisers continually improve their practice and grow their book. That’s our job,’ says Gambale.